Hello out there to all my loyal readers. You'll have to bear with me if I have to skip a day once in awhile. Recovering well from my accident but my body definitely went through a trauma. The verdict isn't in yet on my neck. I'm not too bad when I am up, but when I go to bed that is when the real pain starts. We shall wait and see what happens. Get the stitches out of my elbow on Thursday. Think that's not gonna look too good, but I'm alive and kicking.I really love the picture I'm using today. The background is so beautiful. Won't be long before I have to do inside pics every day. 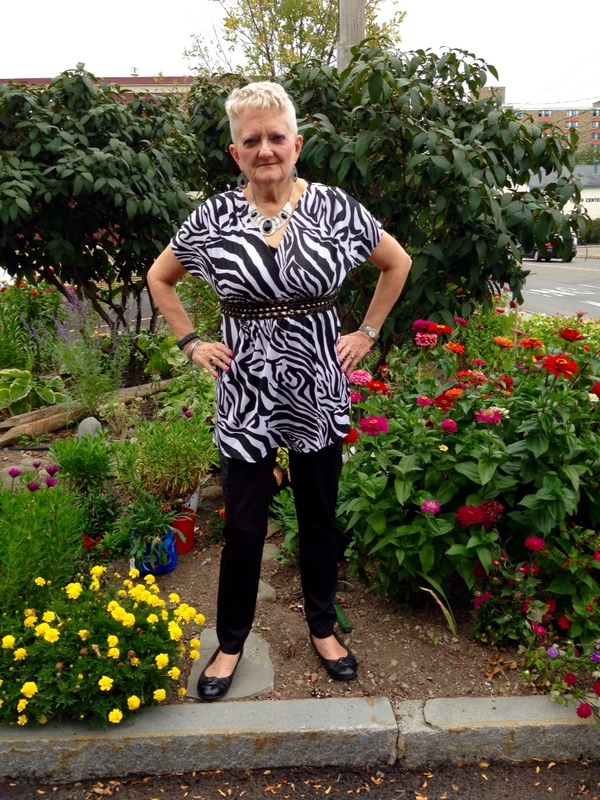 Jo Ellen Jatczak won the naming game again with, “Born To Be Wild.” Everyone seems to love this outfit. The top is another of my thrift store finds. I love it with this necklace and earrings. That necklace is one of my favorite new purchases that I have made lately. This FitBit band is perfect with this ensemble as well as this cuff bracelet. 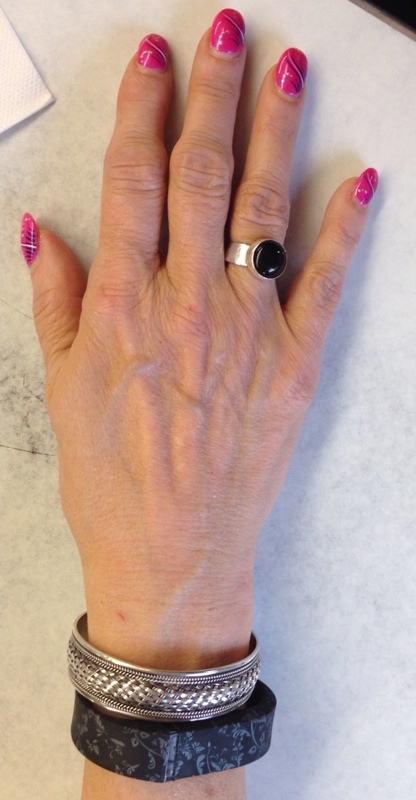 And I always like wearing one of my custom designed rings. Too funny, I just noticed I had my BandCuff on upside down. Been thinking all day about what I should blog about and kept coming back to a post on one of the group's and the terrible experience this person had at her doctor's. Granted doctor's need to tell patient's when they need to lose weight for health reasons, but it needs to be done in a way that doesn't make the person feel worse about themself. A health care professional should never behave in a way that demeans another person. And in the case of this person, they never even looked at her chart to see she was already working on losing weight. Instead, they were demeaning and wanted to push weight loss surgery on her. Now maybe this may be needed for some in life threatening conditioning, but it doesn't really teach anything. Losing and maintaining weight loss is a life long journey as I can attest to. I am currently attempting to lose around 10 pounds I let creep back on. If you have a health care professional that tries to demean you instead of work with you, you need to to find another doctor ASAP. Weight loss is hard enough as it is. 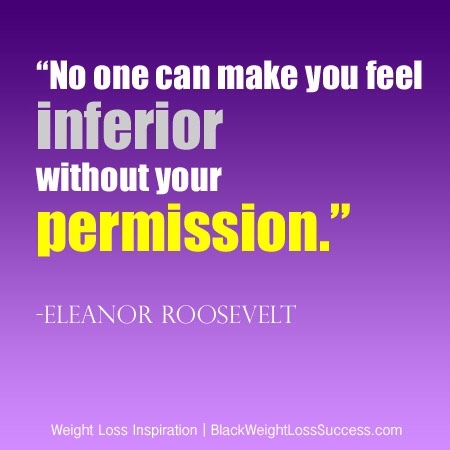 I love the above quote by Eleanor Roosevelt. This might be something you should print out and put where you will be reminded of when you run across people who try to put you down in some way and try to make you feel inferior to them. Don't ever let anyone make you feel this way. The above statement is SO important when it comes to the weight loss journey. 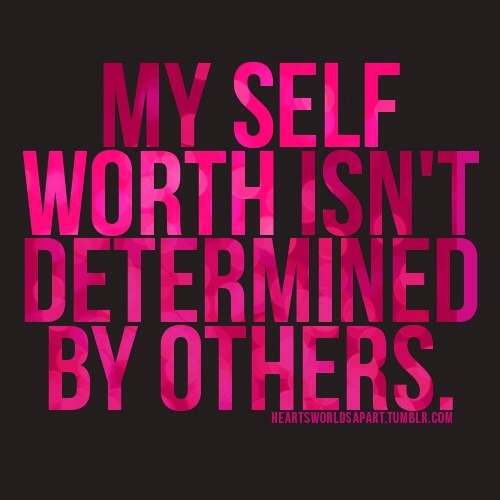 You and you alone determine what your self worth is. If you've already embarked on the journey, I'm assuming that you have already decided you are worth it. Remember every day how important you are and that you deserve to be healthy, fit, and happy with yourself. Don't for a second let other people make you feel inferior. I love everything the above graphic has to say. Read this over and commit it to memory. So many times we begin to doubt that we can be successful or we let other people makes us doubt ourselves. We worry about what other people think or we worry that won't be able to stay the course. We're afraid we're never going to taste success. Like this picture shows take the doubt, the fear, and the worry and roll it away. Stop letting all these things play with your mind and slow you down. 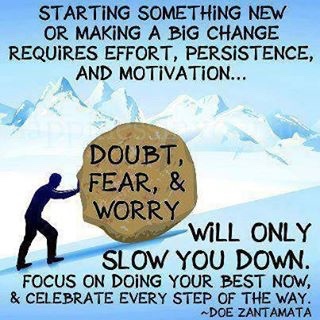 Instead, focus like this says on doing the best you can do every day. Treat each one as a new opportunity to inch yourself closer to the goals you have set for yourself. Every time you reach a milestone you have set for yourself, celebrate it and reward yourself with something you have wanted (as long as it's not food related). Feel good about every little step along the road that is your journey and no one else's. Remove all the negative emotions from your mind and just do the best you can every day. When you do, then success is sure to follow. I'd like to close with this. 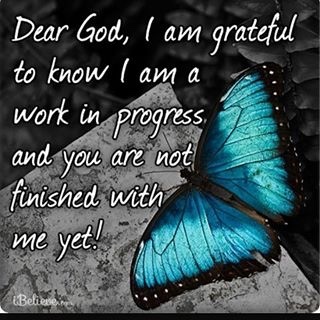 I know I am a work in progress. You are too. And because of my recent automobile accident, I know without a shadow of a doubt that God isn't finished with me yet. In fact, I shouldn't even still be here except for the grace of God. I am more than greatful. I am truly blessed. God has given me the chance to continue the work I have started here, when he could have called me home. Instead, he saved me from a certain death. I will cherish every day I am blessed to be on this earth and I will continue my work of trying to help inspire, educate, and motivate people through my work here, in my Facebook group, “Carol's Inspiration Station” and in the other groups I am a part of. I hope you are blessed in some way by what I have written here today. Remember that you are important. You can do this. Believe in yourself, work hard, and success will find you. Till next time, God Bless.